This recipe is not at all strict as I never measure the relative amount of stock to rice. Instead, I find it's easier just to estimate - to use a little culinary knowledge, but proportionately more plain old-fashioned common sense. Before you start preparing any other ingredients, you'll need to heat the stock to a simmer in a pan. Now finely slice the half red onion. 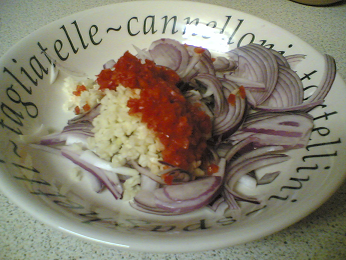 The garlic needs to be finely chopped or crushed. If you don't have a garlic crusher, finely chop it and then sprinkle with a little salt. 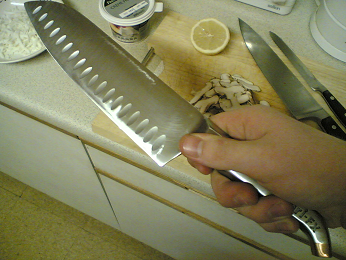 Now use the side of your knife flat against the board to crush the garlic. Cut the pepper in half lengthways and remove all the pith. This needs to be finely chopped. 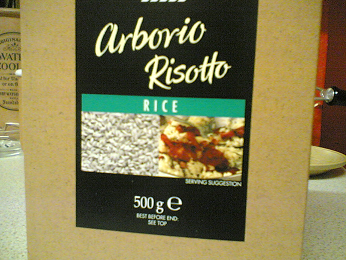 You now have your risotto base. Melt the butter into a non-stick pan and throw in your base vegetables. Now sweat the base until the onions are translucent (sweating is a process where you cook on a low heat, without colouring). Once the base is softened, add your rice. It's imperative to use a short grained rice in this dish. Don't try using basmati or American long grain, because they just won't provide enough starch. Immediately stir to prevent the rice from sticking to the pan. 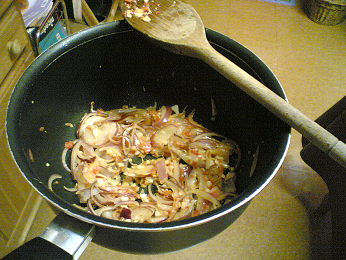 Now add a ladle of the vegetable stock and continuously stir until the ingredients are thoroughly mixed. 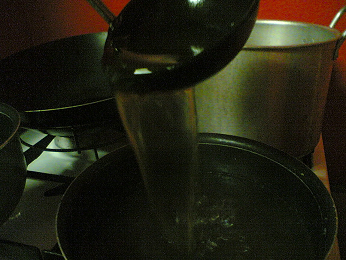 You'll need to keep adding ladles of stock gradually as the liquid is absorbed by the rice, stirring all the while. 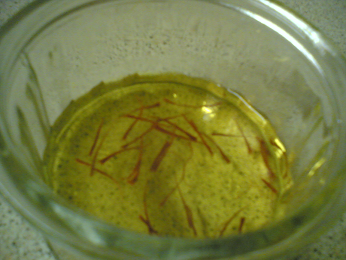 Add the saffron to a small amount of warm water, preferably in a ramekin or small bowl. Stir the strands around, then leave to infuse for a 5 minutes while you stir and top up the risotto. The water should now be bright yellow in colour, and is ready to go into the pan. 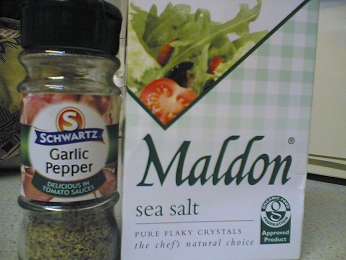 I always add garlic pepper during every stage of the cooking process. You will also need some salt. The amount you use will depend completely on your own taste, but bear in mind that if you're using a commercial stock cube it will already contain salt, so you will not need to add nearly as much as you think. Next up is the star of the show - the ingredient that adds all the texture to the dish. Shiitake mushrooms need to be cleaned under a little cold running water and rubbed gently, then dried. 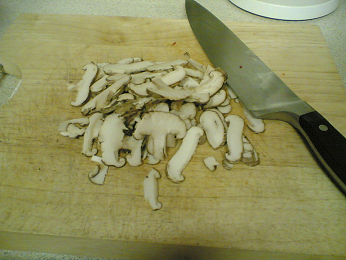 Once cleaned, the mushrooms can be thinly sliced (as above), or diced according to your own preference. They will need to be sautéed briefly in a little oil before being added to the risotto. When you start to notice that the risotto is becoming thick and starchy, you can add the shiitake and the juice of half a lemon. A little citric acid will bring out the natural flavours of the fungi without dominating the dish. 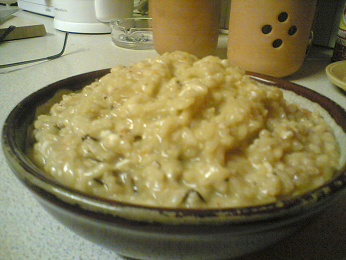 Next, after vigorous stirring to ensure the risotto doesn't stick at this crucial stage, add the crème fraîche. 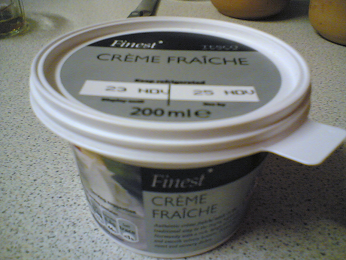 Other than for the obvious health reasons, I find that using crème fraîche instead of double cream adds a lovely sour note. 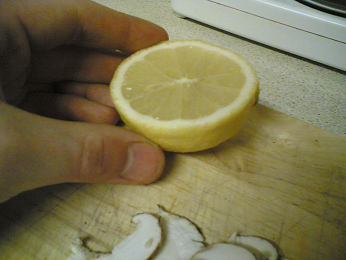 In this recipe, sourness is not provided by the lemon because of the small quantity used. 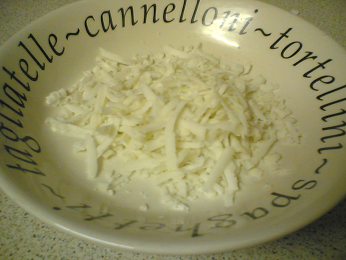 Now at this point, most people would automatically throw in a big handful of parmesan, as it is the cheese classically used in this dish. But I'm never one for following orders, so I used Greek haloumi instead. So that's it really, as simple as that. A delicious, warming bowl of shiitake and saffron risotto, just as good as any Italian could make! By chance, the night I cooked this and took the photographs I happened to have brought my knife belt home from college for its bi-weekly clean. It felt strange using one of my professional knives at home, but the Furi East-West knife really helped me to slice the mushrooms finely.